Fope is a jewelry company operating since 1929 out of Vicenza, Italy. The Flex'It design is one of Fope’s most unique creations. This integral design is patented as a woven gold mesh, so it durable and flexible. 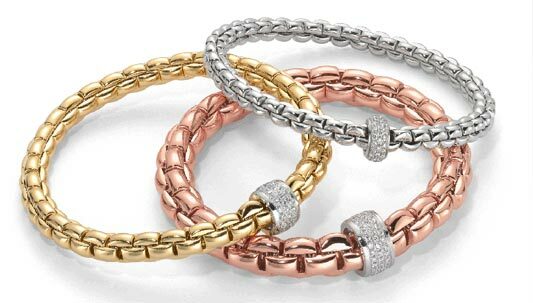 EKA is a basic woven chain available in 18kt white, yellow, or rose gold with white or black diamond stations. The weave in the Love Nest collection is more intricate, and the gemstones on these rondels include sapphires. Olly has a larger link chain. Different gemstones decorate the spheres on the Nuie pieces. The Solo line has a smaller link with multiple variances: monochrome or bi-colored rondels, pave balls, cone shapes, and even white or black pearls. Some models are made up with pave rondels that completely cover the base chain that runs underneath them. The Vendome collection has a square rondel, and they may also cover the chain completely. Wild Rose differs from all the rest because the link is a pyramid shape offering the most geometric incarnation of all the Flex’It pieces. There is a piece for anyone within this line, and all of the pieces can be mixed and matched according to one’s individual style.